Emma McGrattan, the senior vice-president of engineering for computer-database company Ingres–and one of Silicon Valley’s highest-ranking female programmers–insists that men and women write code differently. Women are more touchy-feely and considerate of those who will use the code later, she says. They’ll intersperse their code–those strings of instructions that result in nifty applications and programs–with helpful comments and directions, explaining why they wrote the lines the way they did and exactly how they did it. The code becomes a type of “roadmap” for others who might want to alter it or add to it later, says McGrattan, a native of Ireland who has been with Ingres since 1992. Men, on the other hand, have no such pretenses. Often, “they try to show how clever they are by writing very cryptic code,” she tells the Business Technology Blog. “They try to obfuscate things in the code,” and don’t leave clear directions for people using it later. McGrattan boasts that 70% to 80% of the time, she can look at a chunk of computer code and tell if it was written by a man or a woman. 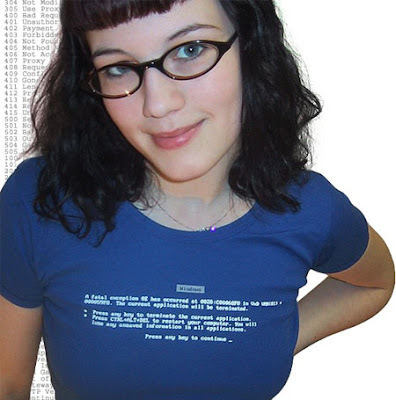 In an effort to make Ingres’s computer code more user-friendly and gender-neutral, McGrattan helped institute new coding standards at the company. They require programmers to include a detailed set of comments before each block of code explaining what the piece of code does and why; developers also must supply a detailed history of any changes they have made to the code. The rules apply to both Ingres employees and members of the open-source community who contribute code to Ingres’s products. Personally I don't write cryptic code, I find most of the guys that do are either not that skilled or assholes. I also find the 20% high, is India skewing that result? I have never worked closely with a geek chick so I have no opinion here. Anybody else?